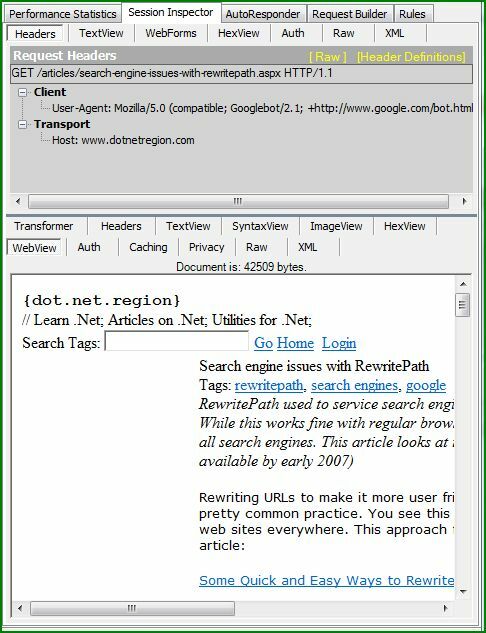 Fiddler is an impressive HTTP/S debugging tool from Microsoft that can be used to simulate various user agents (i.e. browsers like Internet Explorer, FireFox, Safari, etc.) going against your web server without actually installing those browsers on the computer. 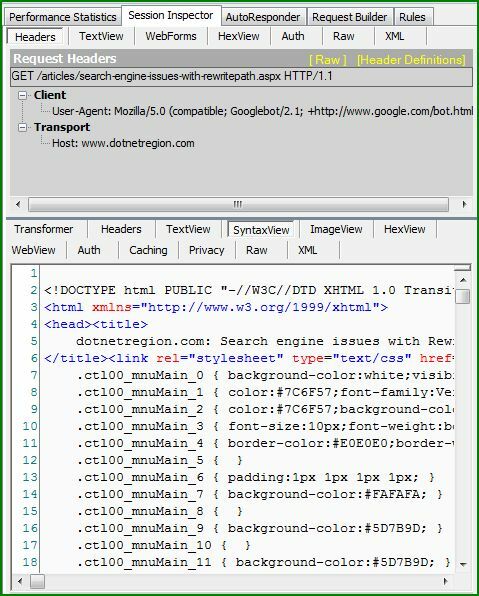 Now, to make it clear, this tool doesn’t display the UI for that particular user agent; so, you wouldn’t see how a particular page from your website looks and feels and behaves inside a particular browser. Fiddler also comes with extensions – which includes Web View Extension. This tab in the Fiddler shows you how the page would be rendered inside the Internet Explorer (see the difference: a particular browser vs. IE). However, you can send a particular user agent string to your server and see what your server returns. At the minimum, your web server should respond without an error to all the legitimate user agent strings (major browsers, major search engine spiders, etc.) when a legitimate page is requested. In the above case, we are testing how our web server (and the web framework ASP.NET 2.0) reacts to this particular user agent. 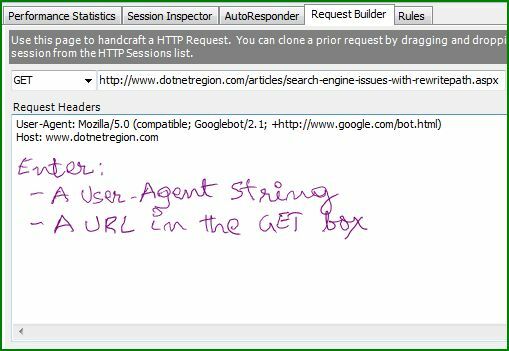 In this case, the user agent is the Googlebot. If everything is working fine, you will see the HTTP OK result code 200. If the result code is 500, you should worry about it – basically the server is erroring out for that particular user agent string. Or, the error could be for a particular page, where you will see the error code for all the user agents. If you have widgets, etc. 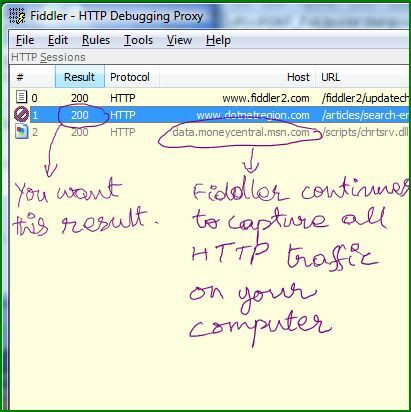 on your computer that are making HTTP calls (in the figure above requests are being made to msn.com), the Fiddler will continue to capture that traffic as well. In general, you don’t to have to worry about them. If these entries bother you, you can simply select them and delete them (Delete is on the right-click menu). 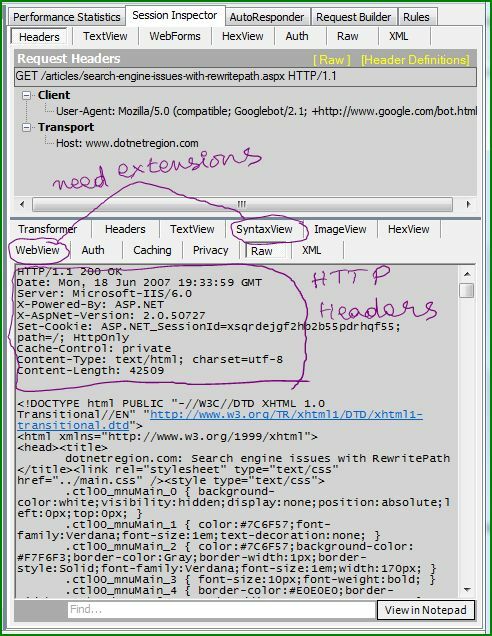 You can use the Session Inspector tab to see what the server sent to this particular request from this particular user agent as shown in the figure below. The __VIEWSTATE hidden input contains a gigantic string to facilitate the state management. The HTML generated by the framework for the menus, master pages, etc. The tabs here are self-explanatory. Two tabs – Syntax View and Web View --come from adding extensions, which are discussed below. In addition, there is a Performance Statistics tab that you can use in conjunction with the Session Inspector tab to see if you can cut down on the number bytes you are sending for this page. In addition to the basic Fiddler, you can also install extensions. Two extensions I found useful for Fiddler are Syntax View and Web View. You can download these extensions from the Fiddler page. As the name suggests, the code is colorized depending on the syntax. Makes it nice to read what came back from the server. After installing the WebView extension, you see how the downloaded page would look like when drawn with the IE rendering engine.